Experience the thrill of flying in a helicopter as the landscape below transforms from salt marshes to desert to extinct volcanoes as you head towards the Gran Canyon. Along the route you will soar over the Hoover Dam, Lake Las Vegas, Lake Mead, Fortification Hill and more. 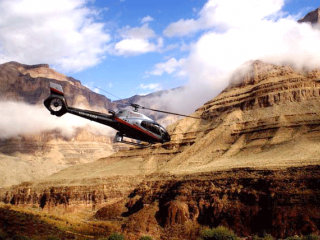 But of course, it's all about the epic Grand Canyon and soon you will be descending 3,500 feet into one of the world's greatest natural wonders to actually land in the midst of this stunning geological wonder. Enjoy champagne and light snacks at an exclusive Grand Canyon landing site located just 300 feet above the mighty Colorado River. As the sun begins to set, journey back through the Grand Canyon, over the Bowl of Fire and conclude your adventure with a flight over Downtown Las Vegas and the Las Vegas Strip as it transforms into the 'City of Lights'. Around 4.5 hours door to door. Flight time to the Grand Canyon is around 45 minutes each way.